Magic / Opening: The defeat of Sunset Shimmer is witnessed from afar by three Sirens once banished from Equestria, who deduce that Equestrian magic is present at Canterlot High. Some time later, Sunset is friends with the humans who defeated her but is not part of their new band, the Rainbooms, and she is still resented by the other students. 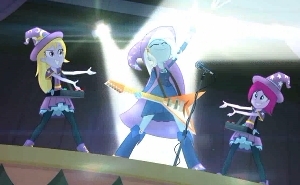 A Great Way to Meet Other Students: The Sirens enroll as new students at Canterlot High and magically enthrall everyone to inspire bitter jealousy and turn the upcoming musical showcase into a Battle of the Bands. Sunset alone sees the magic and informs her friends of the danger. They reveal to her that they often undergo their magical transformations when they play music. Dear Princess Celestia...: The friends send a message to Equestria using a special book. Twilight Sparkle receives the message and builds a portal through which she and Spike return to Canterlot High. Friendship Is Magic: Twilight and her friends try but fail to activate their magic but surmise they can do so through music. Twilight volunteers to compose a counterspell to oppose the Sirens, but she frets over the task and doesn't have a decent song-spell ready in time for the competition. Battle of the Bands: The Rainbooms' first number falls prey to sabotage from several students, but they stay alive. With the entire school (except for Twilight's friends) under the Sirens' spell, the single-bracket tournament quickly reduces the number of competing bands from sixteen to four. The Semi-Finals: As the Sirens defeat Flash Sentry's band, Rainbow Dash's show-off moves nearly activating and exposing her magic. Sunset intervenes, stopping the number cold and leaving Trixie's band the apparent favorite. 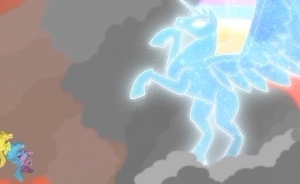 But the Sirens influence Celestia and Luna to choose the Rainbooms as the winner. Nevertheless, they also manipulate Trixie into trapping Sunset and the Rainbooms beneath the amphitheater-style stage. The friends take to arguing over long-standing complaints. Getting the Band Back Together: The Sirens begin their hypnotic performance, feeding off the anger of the feuding Rainbooms. Sunset sees the escaping magic and forces them to reconcile, just as Spike arrives to free them. The Rainbooms sing against the Sirens, and the battle is finally won when Sunset joins in on the side of the Rainbooms. This Isn't Goodbye: Twilight says farewell to her friends at the portal and returns to Equestria with Spike. 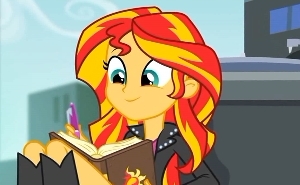 Sunset continues to correspond with Twilight using her book, and joins the Rainbooms to play over the closing credits. Elsewhere, the human Twilight Sparkle studies the strange events surrounding Canterlot High. Character: I greatly enjoyed the villains here. Their power makes them a threat from the very first scene, and even in the climax it seems they have the upper hand. This especially comes through in their music, which is sinister, seductive, and in my opinion a cut above the happy/boastful songs of the Rainbooms. Visually, their thinner and darker outlines set them apart as other-worldly, and their movements even seem a bit more fluid than those of the other characters in the film. And while Sonata has become the fan favorite, I like them all equally and think they work best when playing off one another. And just as the Hate Plague forced the return of Optimus Prime, the Sirens' spell forced the return of Twilight Sparkle. As introduced in Ponyville, the TV series' main character is at her most competent, but while the world of CHS is a bit more familiar to her this time around, she's still a fish out of water in a few ways. Her challenge in this story is one we've seen with other characters a few times on the TV show, that of biting off more than she can chew. I'm happy that Twilight's predicament is caused by others' blind faith in her rather than her own overconfidence, which would have been out of character. Spike has the best of intentions in recommending Twilight as the team's spell-writer, but with all due respect to the number one assistant, he gets this exactly wrong. Recall that as the embodiment of the sixth Element, Twilight is a reconciler; her function is to corral the others, bring out their potential, and focus their power. At Canterlot High, Twilight is the one who brought her five friends together in the first place. Now, because of her obsession with spell-writing, she's oblivious to what ought to be her main task as the rest of the crew falls apart. She later admits she can't believe she missed that. From a story-telling standpoint, Twilight's dilemma serves two purposes. First, it prevents her from resolving the team's conflict too early in the film. This is one of those cases where most of the problems could have been solved if someone had just said something. If the poor communication is frustrating for the viewer, just take that as one of the film's minor lessons. The second purpose of Twilight's obsession relates to her role as princess: "Uneasy lies the head that wears the crown," and all that. Faced with the need to function in the world of CHS, and with her friends all looking to her, Twilight decides to go it alone. But one of the themes of this series is interdependence, and the folly of her self-isolation is clear to the viewer from the very beginning. Sunset Shimmer's challenge in this story is a realistic follow-up to her defeat at the end of the previous movie. The students she once terrorized are understandably wary and resentful, and she's a sixth wheel among Twilight's friends. She interacts peaceably with them, even with former rival Rarity, but she's still held at arm's length. I am thankful we didn't get a temptation subplot with her on the verge of returning to evil; we've had a number of partially-reformed or barely-reformed antagonists on the show, so it's refreshing to see her make a full turn. I would like to see her retain a bit of an edge, still friendly and doing her best to be good, grappling with insecurity, but happy for a chance to fight as long as it's against the bad guys. Her solo at the end gives us just a hint of that. Now given Sunset's various abilities and her familiarity with the human world, the spell-writing task should have gone to her, or else her and Twilight working together. But with Twilight distracted, Sunset gets the more momentous job of reuniting the friends, which puts her in a good position to function as the "sixth Element" here in Twilight's absence. That rainbow always did need a streak of red. The other main characters get plenty of screen time, but in terms of actually doing much besides play music, Applejack and Pinkie are kind of neglected here, as is Spike. I did like hearing AJ get the opening lines to the final song as we cut to credits. Also, we're reminded that these characters are slightly different from their Equestrian counterparts. They don't have the same chemistry as the more mature Mane Six. AJ and Rarity's squabbles have a bite to them we haven't seen in Equestria since the first season, and the pony Pinkie would have tried to distract from the others' disharmony rather than join it. I love the fact that you can really hear the characters' voices in the songs. And I've got to say a word about the friends' boldness and their faith in Twilight. They never show a hint of doubt or hesitation about facing the Sirens, or about her ability to create a working counterspell. This is extraordinary, but it's nothing new. In the last film they were with her all the way, and most notably, when Sunset sent her power beam toward Twilight, her friends didn't run from the blast; they ran toward her, right into its destructive path. For all their faults, their faith in and faithfulness to Twilight shine out as good examples to viewers young and old alike. The human counterpart to Flash Sentry shows up again here as a would-be love interest, driving home the extent to which the spell has corrupted the students. As in the first movie, he's used in the same way a story with a male hero will often use the hero's girlfriend; his presence is thus part of Friendship Is Magic's subversive approach to gender stereotypes in fiction. Speaking of the students, it's a nice touch that they're pretty well mixed around at the beginning, and then revert to their cliques from the previous film once the spell takes effect. Lesson: We have a letter to Princess Celestia! But it doesn't have anything to do with the lesson, so moving right along... By now it seems clear that banishing malevolent magic users to a world without magic is a really bad idea. But I doubt My Little Pony is trying to make an argument for the death penalty, so on to the real lesson: Everyone has a daily choice to make between cooperation for the sake of friendship and competition for the sake of popularity. And magic or no, as Adagio observes, the Rainbooms are just as capable of falling apart as anyone else. Any friendship is vulnerable when disharmony is ignored. I can't really say it any better than Sunset Shimmer: "If you don't work out even the smallest problems right at the start, the magic of friendship can be turned into something else." Among the secondary lessons in this episode is the bad example set by Rainbow Dash. In Equestria, the ponies are fine to just let Rainbow be awesome, mostly without comment except for Rarity's playful sarcasm. But the Rainbooms' reactions to Dash are more in line with what happens in real life when you try to make something all about yourself. It's infuriating, creates bitterness, and leads the others to obsess about themselves as well. One thing that bothered me on my first viewing was the apparent message that competition itself is bad. Of course it's not, since the TV show gives us plenty of friendly contests and a whole story arc revolving around the Equestria Games. But younger viewers or those unfamiliar with the show might get the wrong idea from "Let's Have a Battle" and the way the story plays out. On further consideration, though still with some reservations, I think I agree with what the creators did here. What the Sirens say is basically right but twisted just enough to lead down a dark path. That's how seduction works, not with an outright lie, but with an out-of-balance truth. Of course, the line, "It doesn't matter who you hurt" is totally wrong... It should be "whom you hurt." And finally, don't drop microphones. Seriously. Dents ruin their performance quality, and some mics are worth more than the car I drive. Resonance: You want awesomeness? Here's a Mega Musicorn. There are all sorts of neat visual effects, as well as fun shout-outs fans may pick up, such as a Power Ponies video game and the fact that Rebecca Shoichet gets to sing a duet with herself. And I know everybody else mentions this too, but the "Under Our Spell" song and the bracket montage come together to make the best constructed scene in either of the two films. And though the story has a more serious tone than the previous film, there are plenty of clever comic moments as well. My favorites are Pinkie wearing a cymbal as a hat, Derpy breaking out the popcorn while the other students argue, Rarity's Daft Punk outfit, and Pinkie peeking into the portal at the end. I first watched this film on Halloween night in lieu of a Saw movie. Thanks to Derpy, I got my saw anyway. Speaking of which, there's a cameo of the pony Derpy at the 19:50 mark. There's some good drama this time around; you know you're caught up in the story when you find yourself worrying about things you ought to know will be resolved before the story's over. I really cared about Twilight's frustration, Sunset coming to realize how bad she was and unable to redeem herself in others' eyes, and even Fluttershy's desire to hear her song. I was most affected by Twilight's hesitation to take Sunset's hand upon her return, after being the one to offer it to her last time they met. It's understandable and realistic, but also very sad knowing Twilight is her best hope for a friend. I was also moved by Rarity's crying at the end of "Shake Your Tail." I think it's because Tabitha's voice work was less comical this time compared to her previous crying fits. Brevity of the moment notwithstanding, her serious tears were seriously felt. On the positive serious side, we have the kitchen scene, which went through lots of rewrites but ends up one of the strongest pieces in the film and is essential to properly feeling the Twilight/Sunset friendship at the conclusion. I would have liked to see a later scene with Sunset breaking down as a result of her dilemma and Twilight being the one to give comfort, maybe even taking things a little further dramatically than the TV series would go. My heart is warmed both times Sunset writes in the journal, Pinkie Pie giving the longest hug just before Twilight enters the portal, the cooperation going into the final showdown, and the acceptance of Sunset Shimmer during the end credits. I also thank the audio commentators for the loads of credit they give to the cast and crew as they discuss the film. Logic: There are some oddities with the timeline here. The entire fourth season, which runs from one summer to the next, needs to fit between Equestria Girls and Rainbow Rocks, whereas only a few months have passed at Canterlot High. (The first film featured the fall formal with Sunset Shimmer a senior at CHS. The second story sees her still in school.) There's no evidence that time passes at different rates, but it's possible the portal takes ponies across time as well as space. 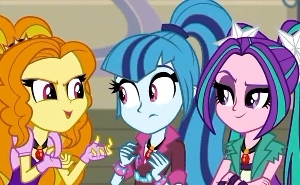 My personal thought is that CHS is in another land in the ancient past, not long after the Sirens were banished, and that Sunset Shimmer's written message magically knew to reach Twilight at a time she could respond to it. Okay, that theory probably has a couple kinks in it, but then headcanon usually does. Other Impressions and Final Assessment: There are a few other things I appreciated for their cleverness. For example, I liked the Sirens' musical names, the idea of communicating through the book, the fine details like Fluttershy tuning her tambourine with an Allen wrench, and the fact that the Rainbooms sing their battle song in the relative major to the Sirens' minor key. Trixie was especially well used here. The story was compelling, and though I enjoyed seeing alt-Vinyl serving a plot-relevant purpose, was anyone else expecting Spike to come back with the other Twilight? Altogether, this is one of those rare sequels that manages to outdo its original, and in this case, it's partly because it's a sequel. It doesn't have to spend as much time setting things up as the first one did. But by that same token, it's not a stand-alone story. It's heavily dependent on the storyline from Equestria Girls, and some key pieces of exposition are moved to the shorts that are thankfully included on the home video releases. I give this Diamond Armor, ranking it just under the first-season finale, The Best Night Ever. It edges out the series premiere for its intense action and great music, but it could have gotten Crystal with a little more use of the neglected characters and with more cinematic drama like the scene I suggested in the Resonance section. * Yes, this is probably one of the innumerable Harry Potter references in MLP, but it's still clever to introduce it in this context, and I like the fact they continue using the magic book into the next film. Ranked 69th of 175 stories overall.